How to Permanently Delete iPhone WhatsApp Messages? Do you worry about your privacy? Does it bother you to think that someone could look through your iPhone after you’ve deleted your WhatsApp messages and find out what you wrote? You’re not just being paranoid: Unless you delete your WhatsApp messages permanently using third-party software that can really scrub your iPhone clean, you are leaving yourself vulnerable to hackers or people snooping on your private conversations. Why Delete WhatsApp Messages from iPhone? Some WhatsApp messages are very private and sensitive that you would not want anyone gaining access to them. You may also want to sell your iPhone or give it away. What happens to the WhatsApp messages on your iPhone then? It is reasonable to delete those messages to protect not only your privacy but also those people you have chatted with. No other tool comes close to the efficiency of iMyFone iOS Data Eraser or iMyFone iOS Data Eraser for Mac. This is a powerful tool that can do the job you want – erase WhatsApp messages permanently from iPhone, 100% unrecoverable. This software has two erase options that will get the job done easily. Erase WhatsApp Messages: Enable you to delete the current WhatsApp messages permanently, as well as photos, videos, voice messages, doc, etc. None of this data can be recovered after this has been done. 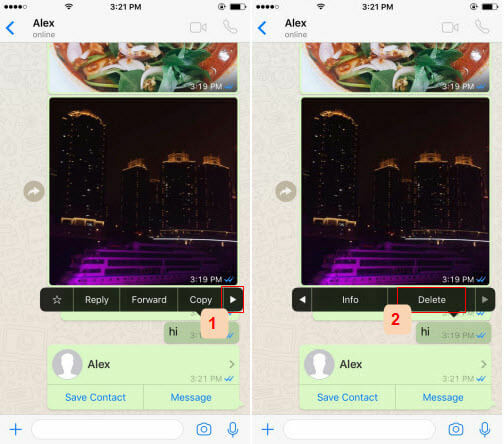 Wipe WhatsApp Fragments: 3rd-party apps, like WhatsApp, can leave private fragments behind and you may not even realize it. They can be found and permanently destroyed, leaving no traces. 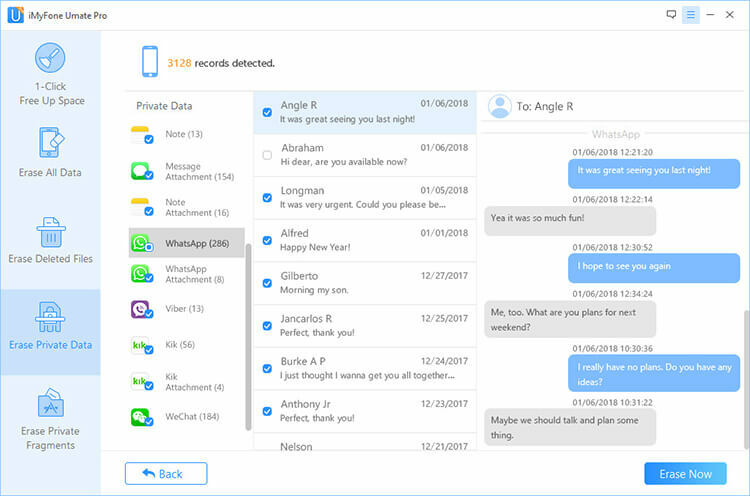 Erase Deleted Files: Previously deleted files which are recoverable will be found out and fully destroyed, including deleted WhatsApp messages. Step 1: You just need to connect your iPhone, and launch iMyFone iOS Data Eraser. 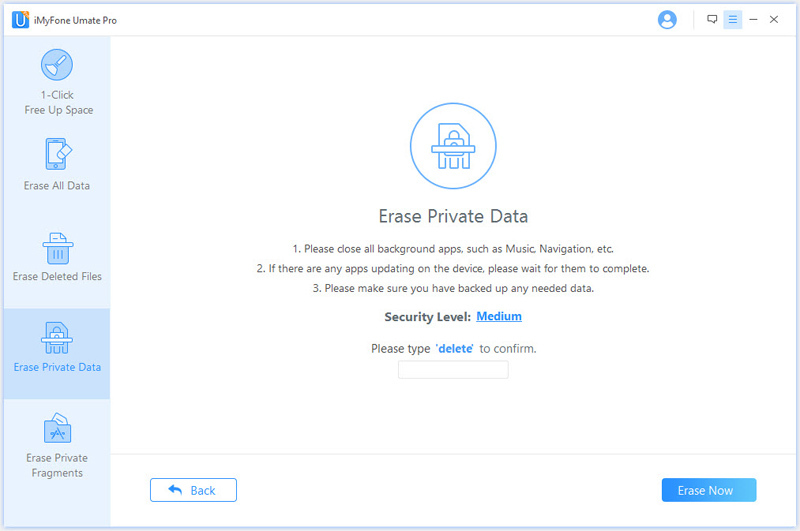 Step 2: Choose "Erase Private Data" and hit "Scan" button. 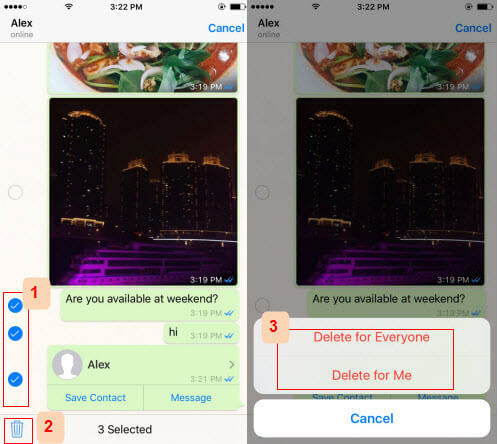 Then you can preview and select WhatsApp messages or attachments and tap "Erase Now". Note: You can also choose "Erase Deleted Files" mode to permanently wipe deleted WhatsApp messages. Step 3: Type "delete" into the box to confirm and start the erasing process. iPhone Space Saver: Use iMyFone to perform this function and you will be able to get huge space back on your device by compressing iPhone photos, deleting in bulk multiple photos/videos/Apps ect. iOS Tune Up: By removing all hidden iPhone junk fils and temporary files, your iDevice will run smoothly! WhatsApp cache will be cleaned as well. Erase Deleted Files: Manually deleting data is just invisible from your device. They can be found out and permanently deleted if they are still under the risk of recovery. Erase All Data: If you are planning to sell your old iPhone or send it to repair, then not only personal WhatsApp messages, but also all iPhone private data, should be erased permanently. To do this, we choose iMyFone instead of "Factory Reset" because data erased by iMyFone is 100% unrecoverable! Note The ways to delete WhatsApp messages discussed below cannot promise deleted data is unrecoverable. 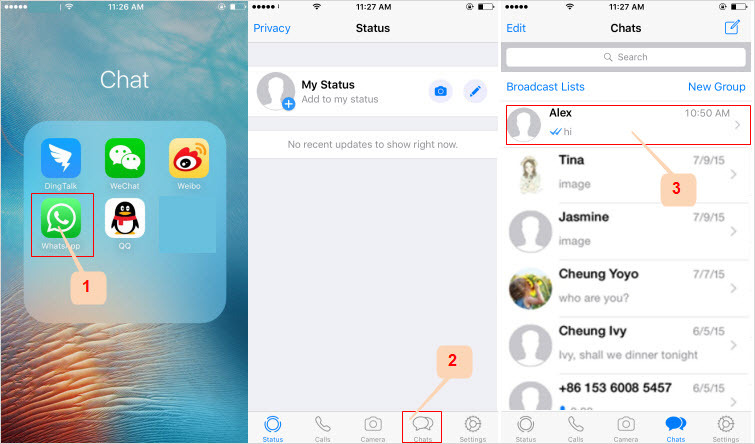 Instead, using iPhone recovery tool can easily access and retrieve the simply deleted messages. If you want to secure privacy, use the permanent way. WhatsApp has features that one can easily follow to remove a message or multiple messages at once from iPhone. 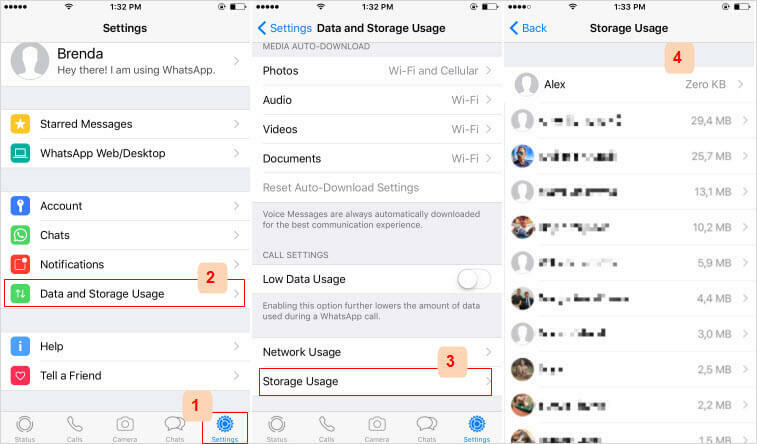 The following steps will assist you to get rid of the WhatsApp messages you want to delete from your iPhone quickly. Launch WhatsApp on you iPhone. Tap Chats tab from the bottom. Select a chat where you want to delete messages. Press and hold a message you wish to delete. It will pop up various options. Tap the triangle icon and then tap the Delete option. Check other messages you want to delete and tap on the trash can icon. Choose Delete for Everyone or Delete for Me. The selected messages will be deleted. You need to delete select every unwanted messages one by one. You can't delete messages from different chats at the same time. It takes time especially if you have lots of messages to clear. Choose Settings tab from the bottom. Tap Data and Storage Usage and then choose Storage Usage. Choose the chat you want to delete messages. 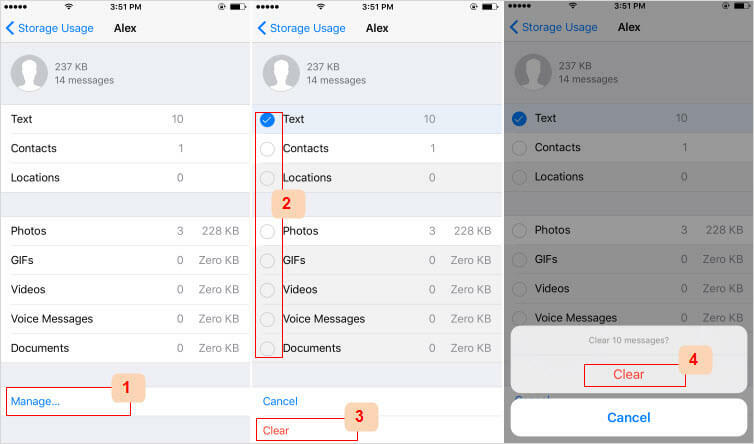 It will show you how much space has been occupied by text (messages), photos, videos, etc. Tap Manage. In this case you want to delete messages, check Text and click on Clear. Confirm it by tapping Clear again. Once WhatsApp is launched, head over to the Chats screen. Slide the chat you want to delete from right to the left. Tap More and choose Delete Chat. Confirm it by tapping Delete Chat. The whole chat will be deleted from your iPhone. This not only deletes text messages, but also voice messages, photos, videos, docs, etc. You can't selectively delete WhatsApp data. 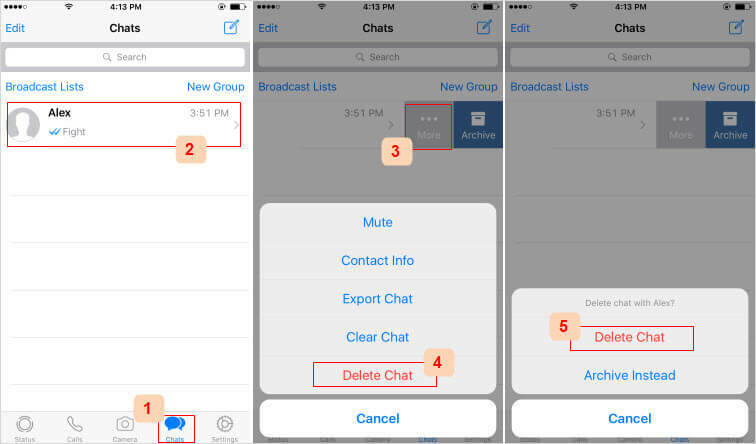 The above are the simple steps to delete your iPhone WhatsApp chat. However, if you want to delete a Group Chat, an Exit button will appear instead of Delete. When you exit, just swipe to the left again and tap "More." Finally, click on "Delete Group". Although deleting WhatsApp messages and chats using the two steps above will delete your messages, they can still be recovered through a recovery tool. If you do not want this to happen, then you need to delete your messages and chat permanently. The only powerful way to do that is by using iMyFone iPhone data eraser. So far you have seen the benefits of using iMyFone to delete WhatsApp message permanently on iPhone. It is time to get this software and benefit from its functions.